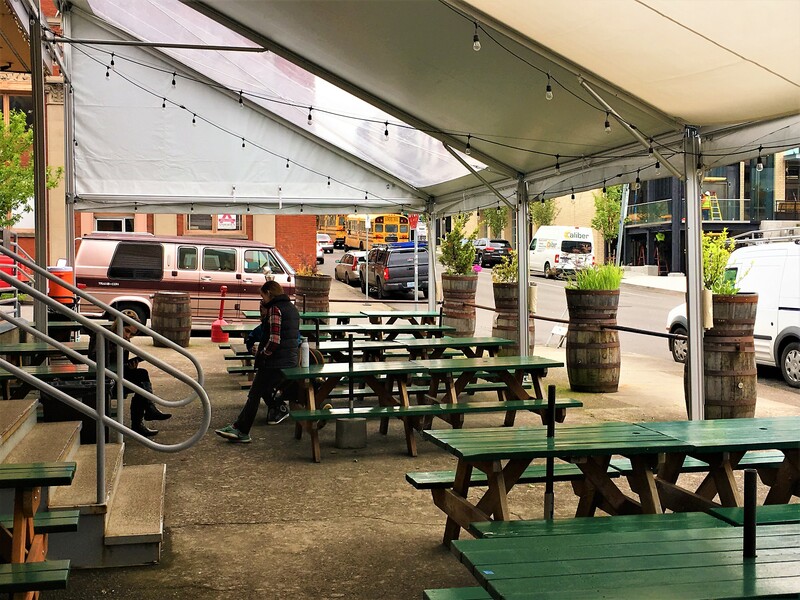 Roll Out the Barrel at the House of Sour..
Cascade Barrel House is kind of an unassuming structure on SE Belmont Street – a plain rectangular building with a large row of windows on the front and an awning over a patio accommodating a number of picnic tables in front. It has essentially no ambiance, but that was offset because I was having another lunch with my favorite group of tax lawyers – not a group which you would expect to demand a rich environment – just one which allows a break from interpreting provisions of the Internal Revenue Code. The interior is also kind of stark – a few round wooden tables with steel stools and a bar which faces a bunch of taps ingrained in six barrel-type housings. Two big screen TVs are available for watching sporting events. 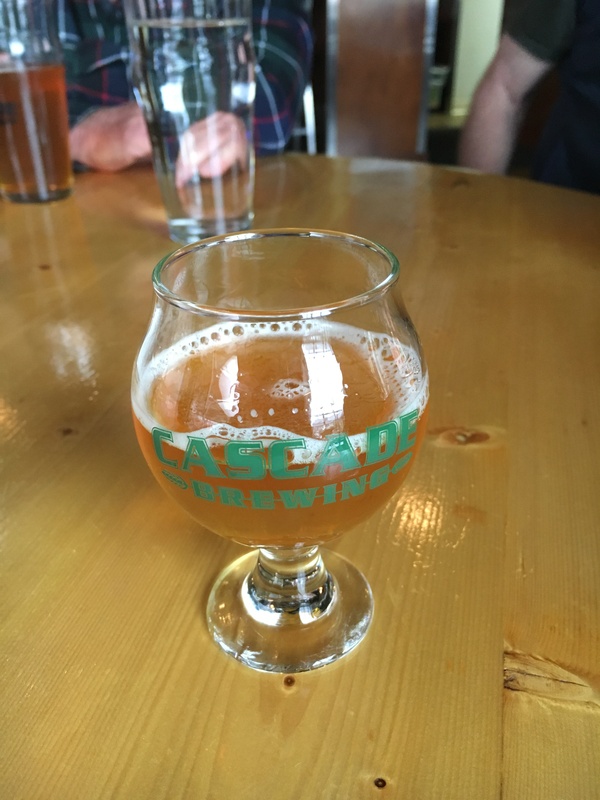 While we had no expectation of an intriguing interior – typical of most dive bars (like the recently reviewed and nearby Gil’s Speakeasy) and many breweries, at least the beer at Cascade does have interesting and unusual characteristics. 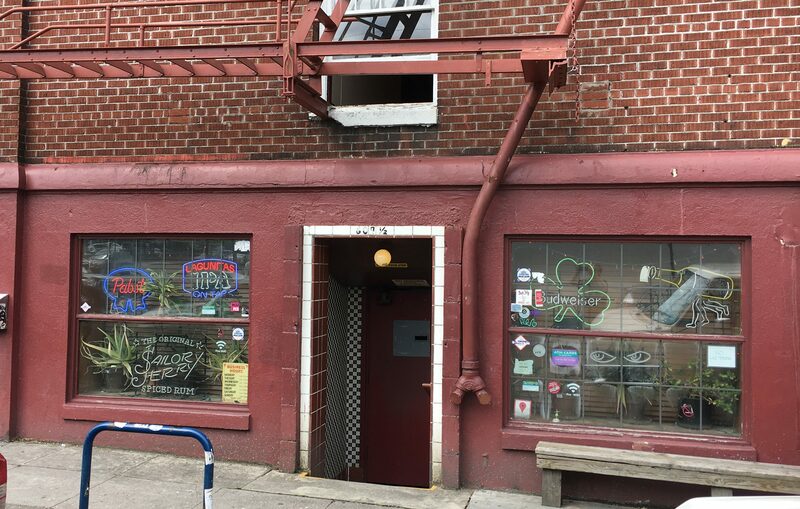 Gils Speakeasy – no sour beer, but dive bar ambiance! 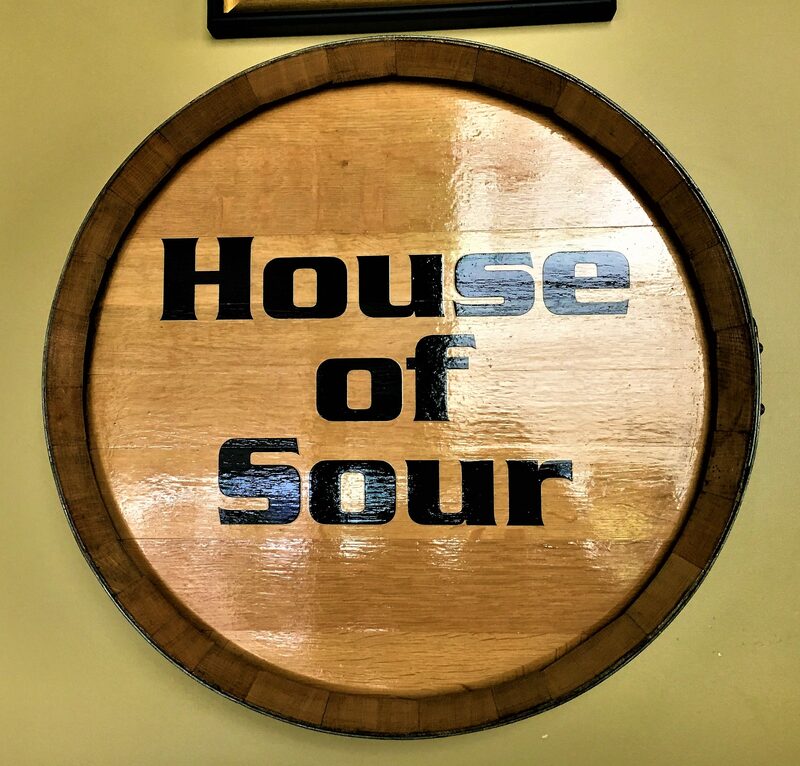 As one enters, a large barrel-end displayed on the wall with the words “House of Sour” in large black letters greets the customer. 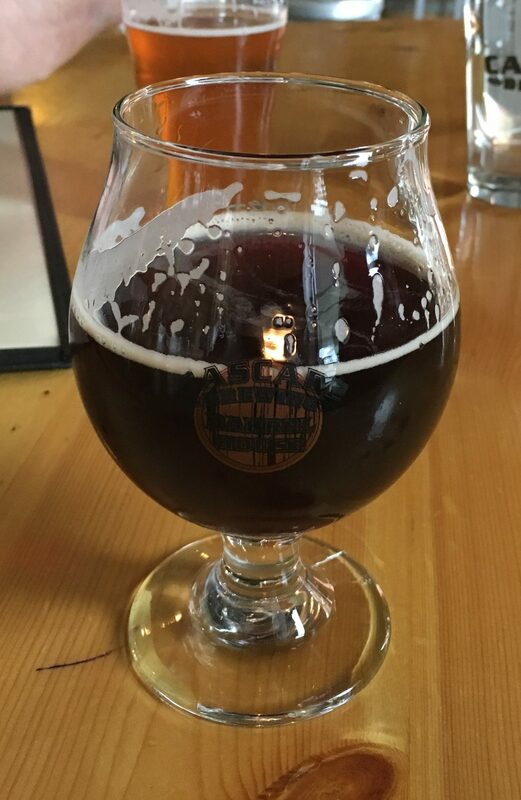 A majority (about 12 or 13 of the 18 beers on tap) are considered sour beer. 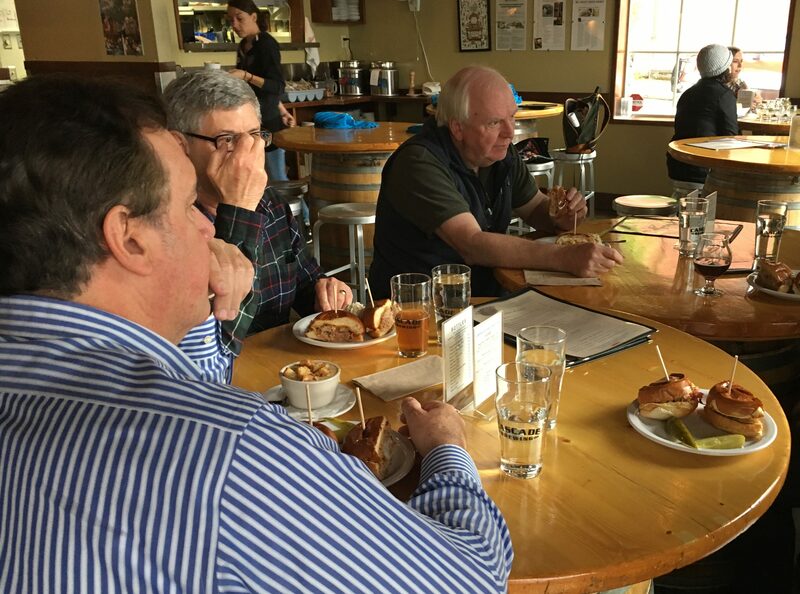 How was our lunch at Cascade Barrel House? (hereafter CBH) Well, there’s a limited menu – a few decent sharable appetizers, four sandwiches – kind of expensive with most at $10.50 and $11.00 not including a side dish – three were available ala-carte for $1.50 to $2 extra – and four salad options. Reuben sandwiches not a strength although at least they weren’t sour! Coincidentally (and maybe because of the lack of choice), all five of us had a pork pastrami-Reuben sandwich ($10.50), which I thought was somewhat mediocre especially for the price, and would not order again. For example, compare the Reuben at former Portland Mayor Bud Clark’s Goose Hollow Inn, which advertises it’s sandwich as “The best Reuben on the Planet.” Based on Thebeerchaser’s experience several times, this may not be an exaggeration and it is available with sides for $9.95 and $10.95. Three of the five of us had beers – all Cascade’s own – Oblique Coffee Blonde Stout – 6.5% ABV (“This blonde coffee stout features 1-1/4 lbs per barrel of single origin coffee beans from Colombia called El Corazon, roasted locally by Oblique coffee roasters. And the dark Sang Noir – a whopping 9.5% ABV (“This deep, dark double red was aged over a year in Pinot and Whiskey barrels, then blended with a barrel of Bing cherries.” – Beer Advocate.com) Reaction to both was very good – they were unusual and not available at most pubs. Prices for the beer are on the high side – eight ounce sour mugs run from $6-8 with pints of non-sour about $5 or $6. 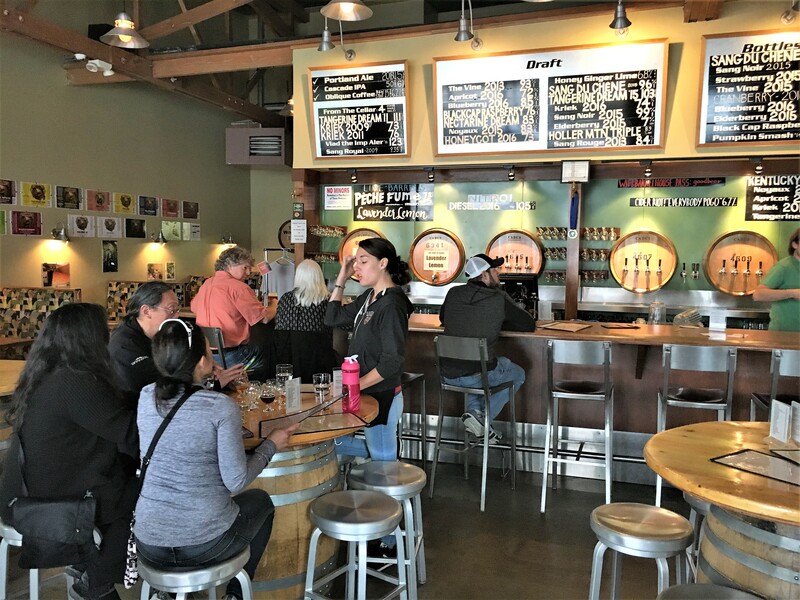 I had one of the small glasses for $2.50 – this is one place, given the characteristics of the beer, where the small glasses of beers may be a good idea to hone in on one that comports with your taste in sour beer – provided you have one. 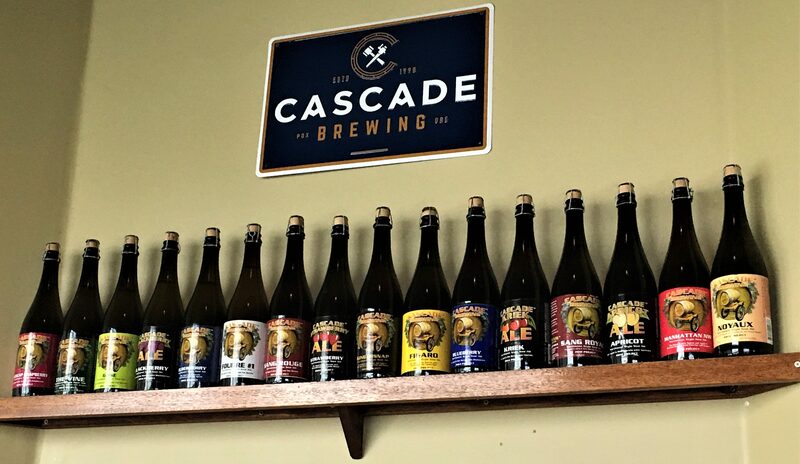 If not, you can always try the Cascade IPA, which also gets good reviews. 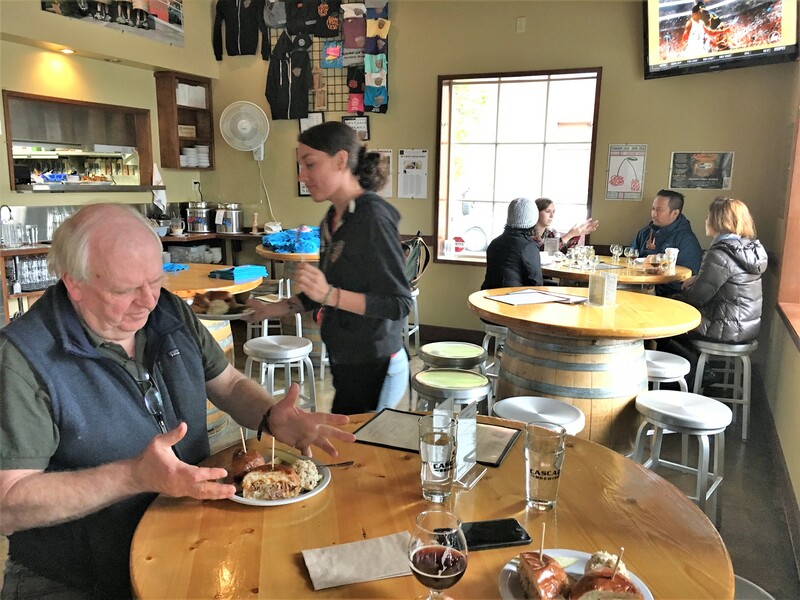 And the staff was very efficient and helpful – both our server and bartender, who answered some questions about the history of Cascade. 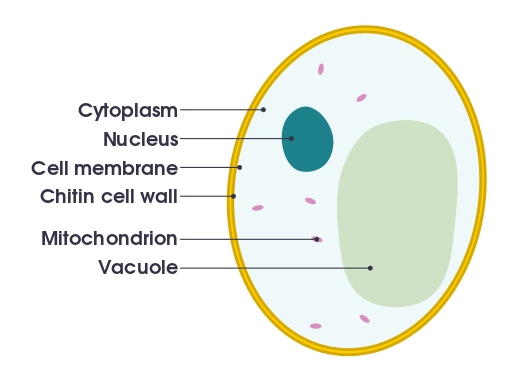 “Sours get their trademark tartness and sourness from bacteria and wild yeasts – Lactobacillis, Acetobacter, Brettanyomyces and other critters that you wouldn’t find in other styles of beer. Each type of bacteria gives its own trademark flavor and aroma…..For some of the sour styles, the wild bacteria and yeast come into the beer during an open or spontaneous fermentation (something that sounds like a college date…..) with open vats of wort exposed to natural air. 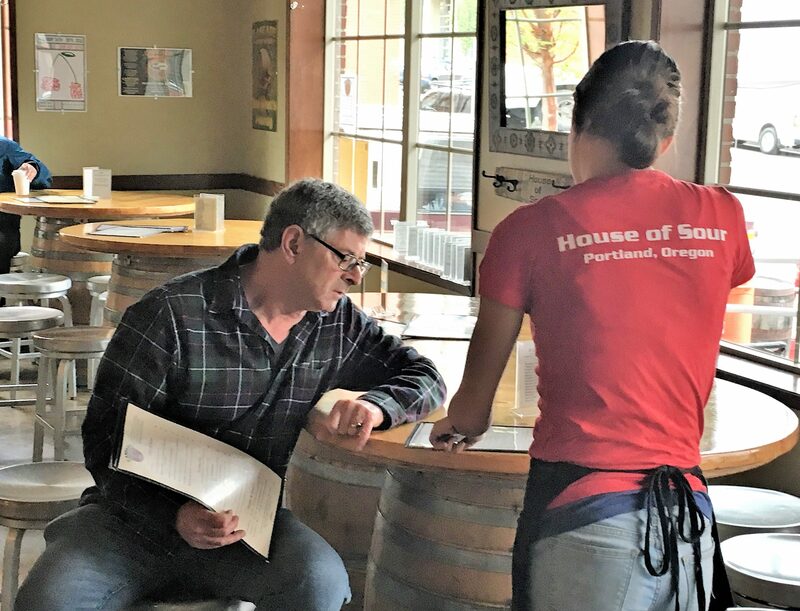 Our bartender emphasized how long it takes to age the sours and this may be one reason that while the tasting room at CBH is very small, according to their website, they have another 5,000 square feet where sour beers are aging in barrels. 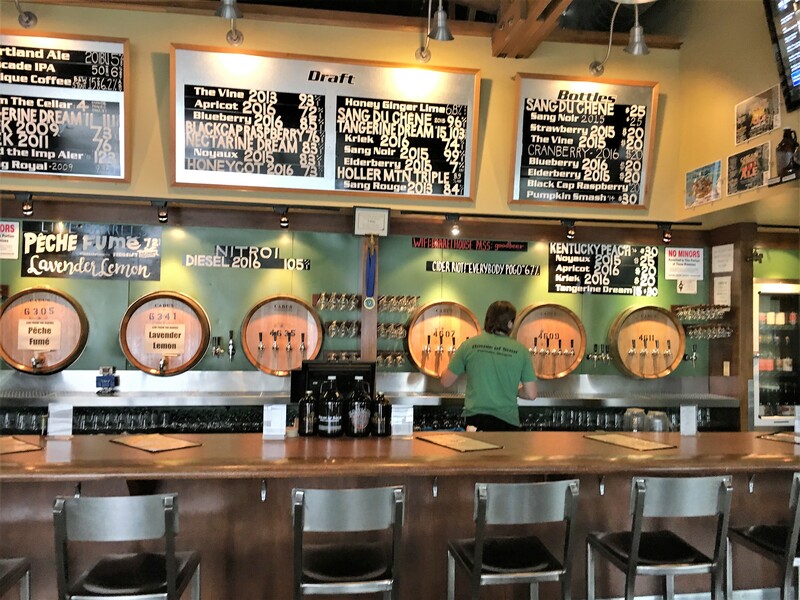 And boy do they have a wide range of bottled fruit beer selections – enough for your quota of fruit for the month and possibly tempting you to plant the bottles in your yard to see if they might grow at your home i.e. tangerine, apricot, strawberry (3 different years), blackcap-raspberry, raspberry, blueberry (3), cranberry (3) and elderberry (2). 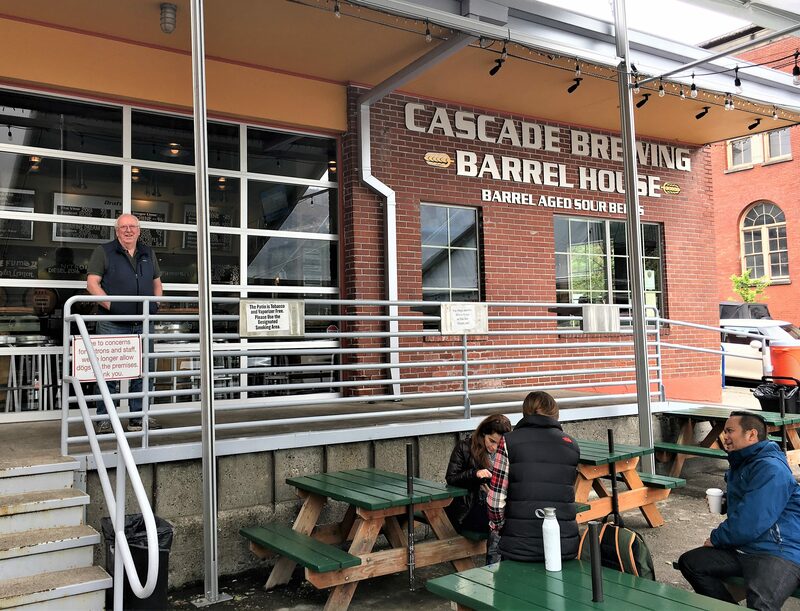 If you just want a good pub or bar experience, the Cascade Barrel House isn’t necessarily a great option. 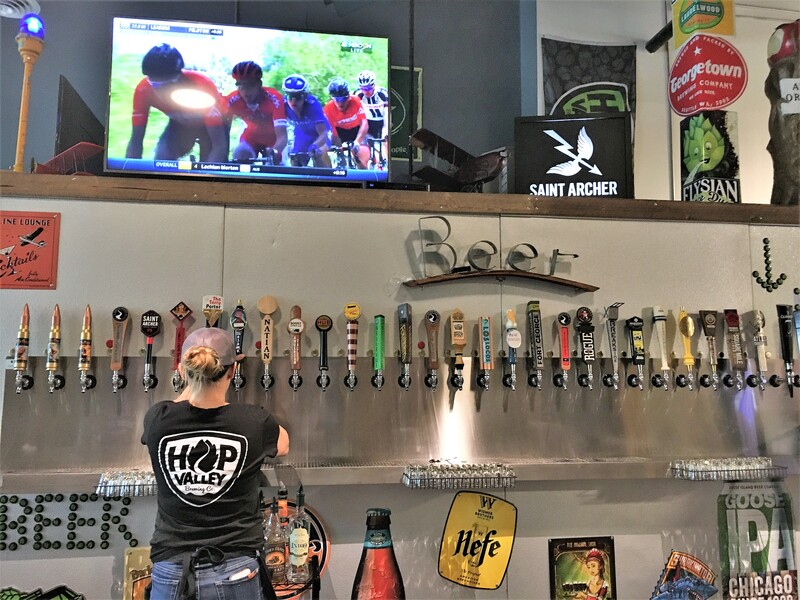 And if you decide to try it, you might want to check them out on “Tap It Tuesday” nights at 6:00 when they tap a new creation which gets good reviews. Happy Hour is Monday-Friday from 4:00 to 6:00. But if you want to explore sour beers or if you are a real fan of the concept, the CBH is a good bet. 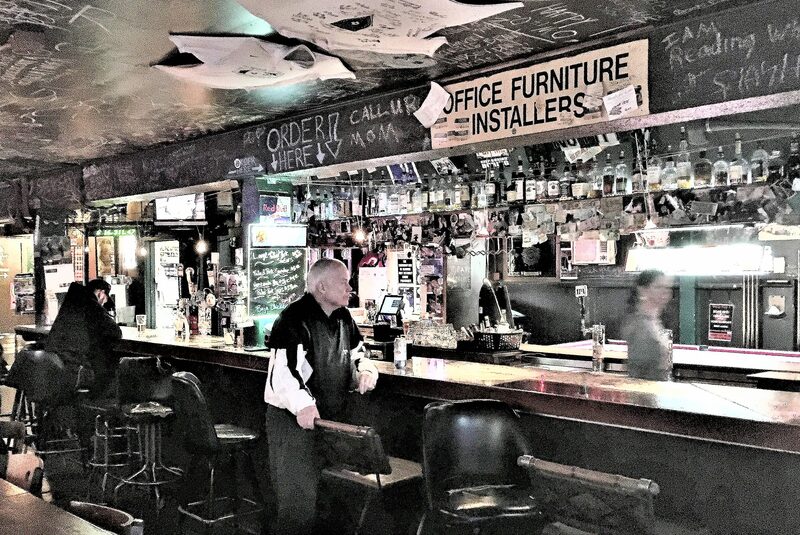 And maybe another option is to have a good (albeit expensive) sour beer and then walk just five blocks to Gil’s Speakeasy for a great environment and a $1.50 happy hour PBR nightcap. You can.even listen to Dion and the Belmonts sing “Teenager in Love” on the classic juke box!